This fall-inspired Butternut Squash Lasagna is layered with sweet and nutty squash puree, crumbled Italian Amaretti cookies and a basil-scented bechamel sauce! A show-stopping vegetarian pasta dish for guests! 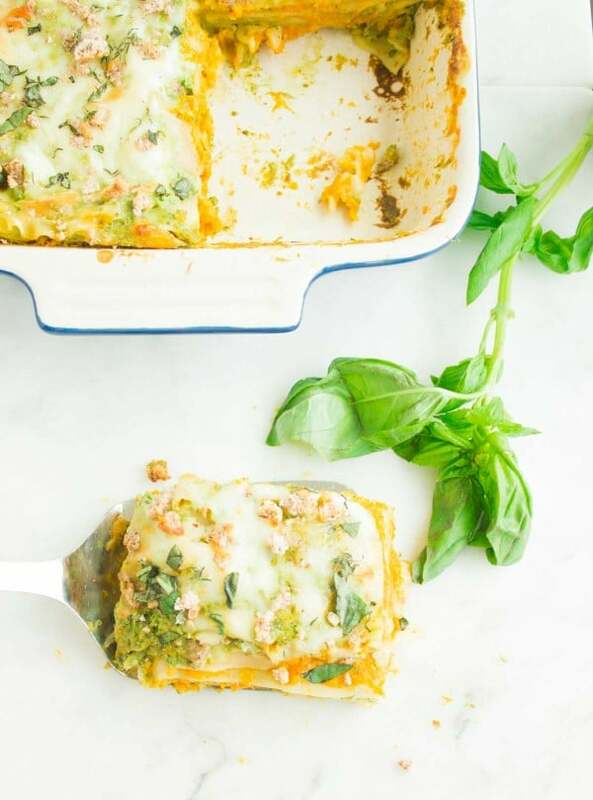 This fall-inspired Butternut Squash Lasagna recipe is a gorgeous tribute to Italy and Italian flavors! Smooth roasted sweet butternut squash filling flavored with Parmesan cheese and sweetened with Amaretti cookies layered between tender lasagna sheets and a sweet basil béchamel sauce, then topped with more Amaretti cookies for a slightly sweet crunch! If you read this easy speedy blue cheese lasagna recipe, you’ll know how much I love lasagnas, and if you haven’t—what are you waiting for? There can’t ever be enough ways to enjoy lasagna, it’s one of those comfort food essentials that lifts you up on any gloomy day. Now that doesn’t mean you should hold back on making lasagna when you’re in a happy place—because that happy place will feel oh-so-much happier with a nice cheesy bite of lasagna too! 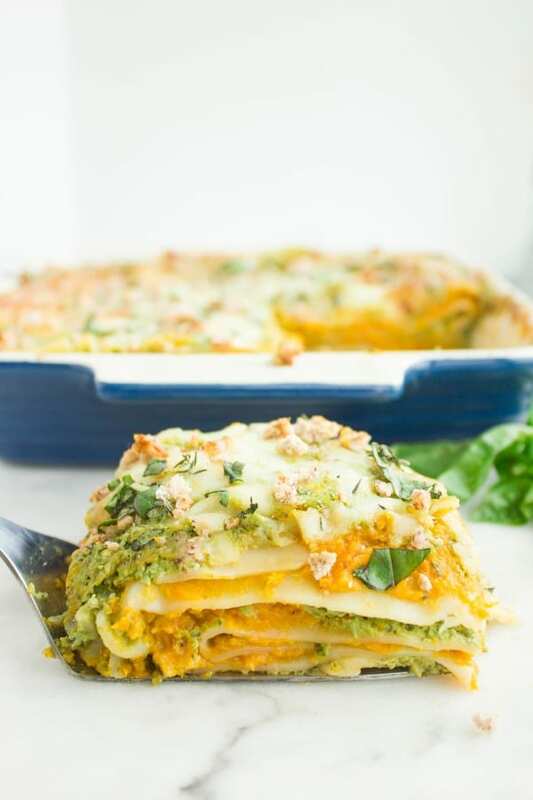 This Butternut Squash Lasagna is a must try, and yummy addition to your everyday comfort foods list. It comes with crushed Amaretti Cookies for extra sweetness and is layered with a creamy, dreamy Basil-Scented Bechamel Sauce! This is fall lasagna perfection! Arrange the butternut squash cubes on the baking tray, season with salt and olive oil and toss the butternut squash evenly to make sure they’re well coated with seasoning. Roast for about 30 minutes until tender. Remove the tray from the oven and allow it to cool. 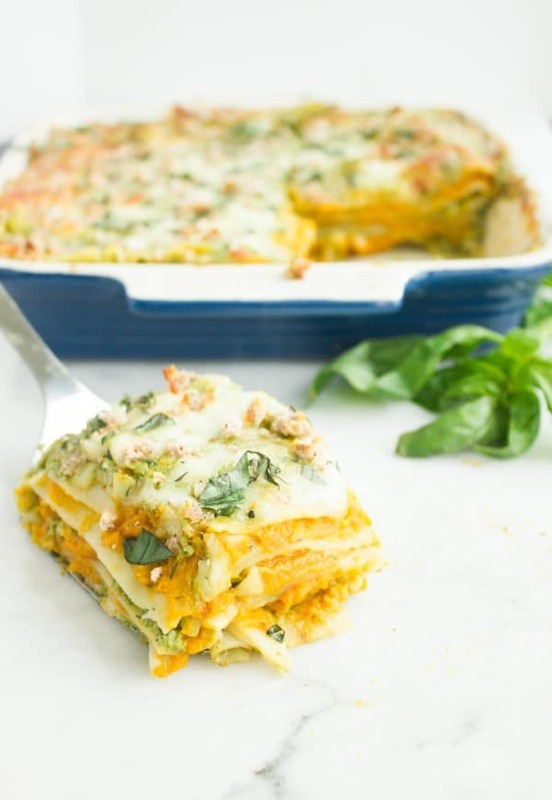 I have to say that the beauty of this Butternut Squash Lasagna recipe, aside from the squash and Amaretti, lies in the sweet basil béchamel sauce. 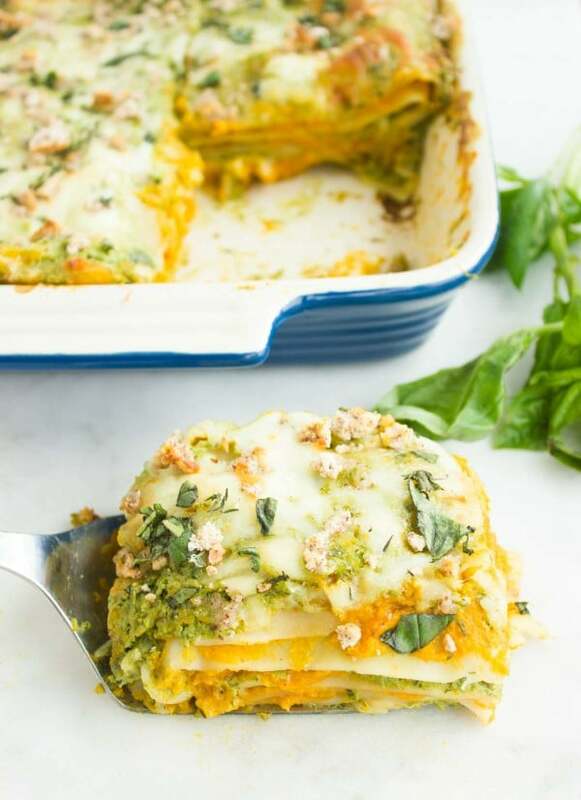 The addition of fresh basil to the classic béchamel makes a huge difference and takes this vegetarian fall lasagna to a whole new level of deliciousness! Over medium-high heat, melt the butter in a medium pot. 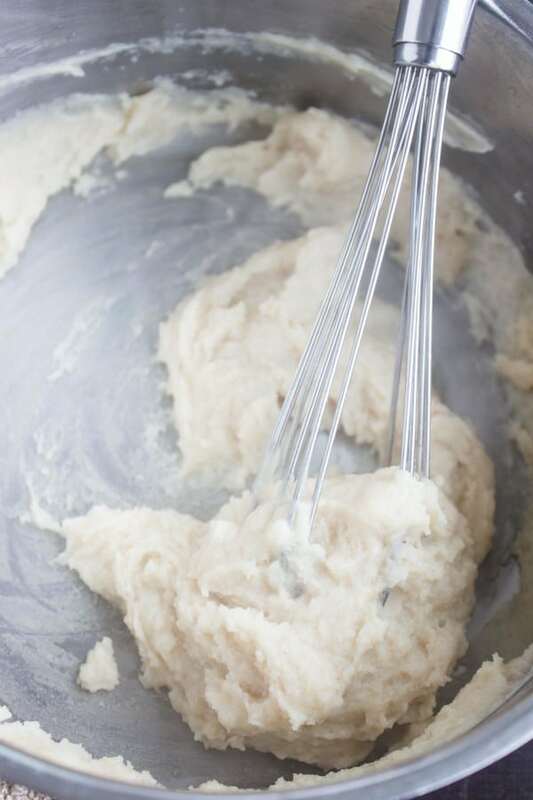 Add the flour and whisk them together for a minute then gradually add the milk in 3 portions while whisking to ensure the sauce is smooth. 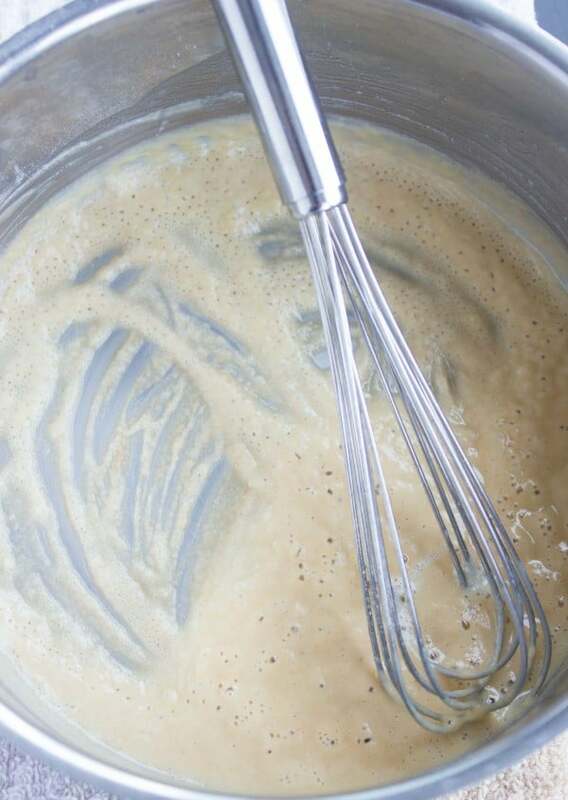 Allow the bechamel sauce to simmer on medium-low heat for about 8 minutes until it thickens. Remove the sauce off the heat and add the nutmeg. When the sauce has cooled down a little, take a third of it and blend it with the fresh basil leaves until smooth. Now place the basil sauce back with the original béchamel and mix them together for a sweet light green basil scented béchamel. Add the parmesan cheese and 2 tablespoons of the crushed Amaretti cookies. Season the sauce and set aside. Finish off the butternut squash filling by pureeing it in a food processor along with the parmesan cheese and amaretti cookies until smooth. Butter the bottom and sides of a 9”X13” pan and ladle ¾ cup of the basil sauce at the bottom, top that with 2 or 3 sheets of lasagna (depending on the size—but make sure the entire surface is covered), and spread half of the squash puree over the pasta, top with a layer of sauce,a sprinkle of parmesan, a sprinkle of mozzarella cheese and Amaretti cookies. 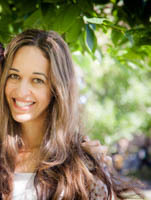 Then repeat the layering process two more times. Cover the pan with foil and bake in a preheated 375 degrees oven for about 30 minutes. Uncover the butternut squash lasagna and sprinkle the remaining mozzarella cheese on top, then bake an extra 10 minutes until cheese is melted. Sprinkle with fresh basil. Cool for 10 minutes and serve. To make this butternut squash lasagna in a snap, prepare the squash as well as the bechamel sauce a day or two in advance. So the day of, all you really need to do is just assemble and layer your lovely lasagna and bake it. When it comes to the butternut squash, I love roasting mine and then pureeing it. You can also micro-wave it if you prefer. And if you love a chunky squash-ish texture in your lasagna, then leave the chunks whole, but I would strongly recommend pureeing them. 1 tablespoon Amaretti cookies crumbled--store bought or thisespresso amaretti cookies without espresso. Arrange the butternut squash cubes on the baking tray, season with salt and olive oil and toss the butternut squash evenly to make sure they’re well coated with seasoning. Roast for about 30 minutes until tender. Remove the tray from the oven and allow it to cool. In the meantime, start making the sweet basil sauce: over medium-high heat, melt the butter in a medium pot. Add the flour and whisk them together for a minute then gradually add the milk in 3 portions while whisking to ensure the sauce is smooth. Allow the sauce to simmer on medium-low heat for about 8 minutes until it thickens. Remove the sauce off the heat and add the nutmeg. 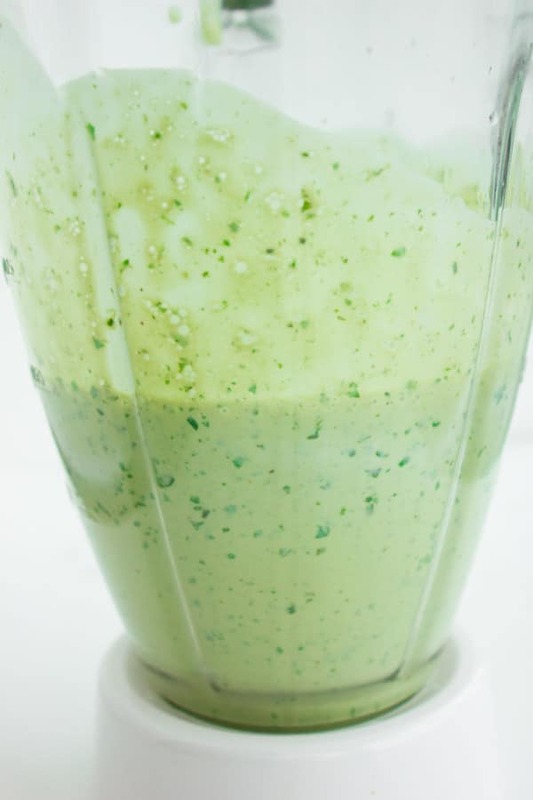 When the sauce has cooled down a little, take a third of it and blend it with the fresh basil leaves until smooth. Assemble and bake the lasagna: butter the bottom and sides of a 9”X13” pan and ladle ¾ cup of the basil sauce at the bottom, top that with 2 or 3 sheets of lasagna (depending on the size—but make sure the entire surface is covered), and spread half of the squash puree over the pasta, top with a layer of sauce,a sprinkle of parmesan, a sprinkle of mozzarella cheese and amaretti cookies. Then repeat the layering process two more times. Cover the pan with foil and bake in a preheated 375 degrees oven for about 30 minutes. Uncover the lasagna and sprinkle the remaining mozzarella cheese,and then bake an extra 10 minutes until cheese is melted. Sprinkle with fresh basil. Cool for 10 minutes and serve. When it comes to the butternut squash, I love roasting mine and then pureeing it. You can also microwave it if you prefer. And if you love a chunky squash-ish texture in your lasagna, then leave the chunks whole, but I would strongly recommend pureeing them. Can I say, “yummy!” As I lick my lips. 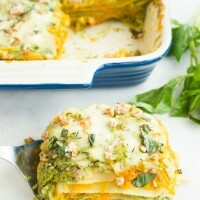 This squash lasagne looks and sounds delicious. Thank you for posting. Yet another recipe noted to try. I’m drooling! I love butternut squash! This looks delicious! This has got to be the most interesting and creative lasagna I’ve ever seen! You can also never go wrong with béchamel sauce so two thumbs up there. lol! I’m curious about how this tastes so I’ll have to make it soon 🙂 BTW, your pics are so beautiful too! Hi Jackie, yes absolutely! It can be even frozen for up to 3 months if you like. Just reheat it in a 375 degree oven and serve! What a uniquely delicious lasagna! 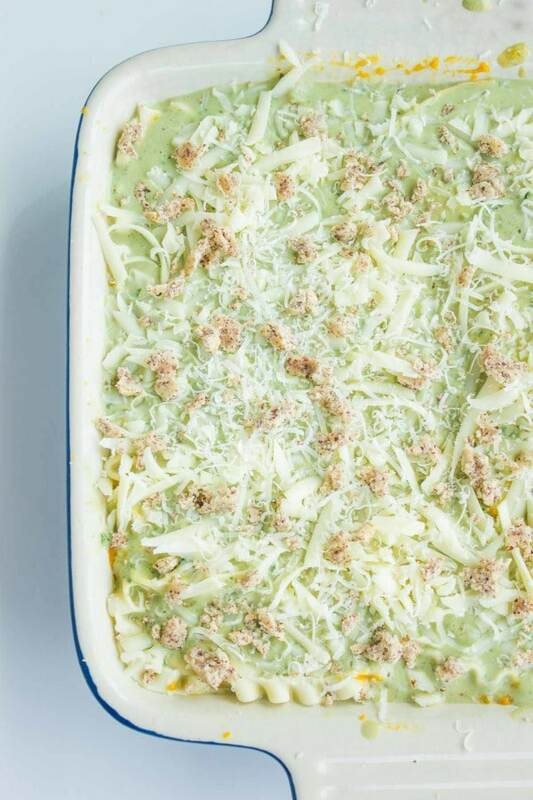 I am really in love with the basil béchamel — I can imagine how fragrant this is! And the cookies?! Sounds interesting and like it truly works well with this! Very nice! I love creative takes on lasagna! This sounds like a delicious dish! I’m smelling that lovely bechamel right now. I would wear basil as perfume if I could. I love the scent — so clean and fresh. The lasagna dish looks so good and the crunchy addition of the cookies is perfect. What a wonderful alternative to the regular lasagna. The arametti cookie addition sounds so delicious! I love the basil sauce as well. Basil is so fresh and delicious- one of my favorites. What a pretty dish. Totally genius use of the cookies. A little sweetness, a little crunch. SOunds like the perfect addition.